There’s nothing finer than sitting down in an evening and learning how to play a song or creating one of your own. 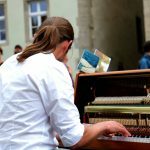 You’ll have moments of great serenity and self-accomplishment that very few other instruments can provide. If you decide you want to make it professional, it’s important that you use the best acoustic electric guitar that money can buy. 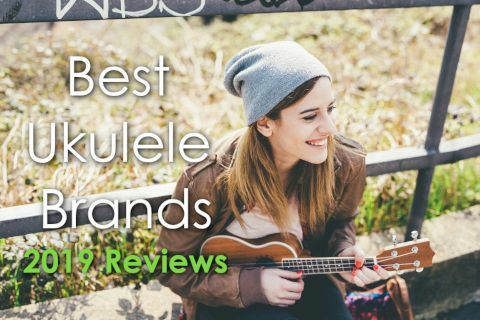 But trying to find the best acoustic electric guitar can be a bit overwhelming if you don’t know where to start, but finding a good one will make learning how to play very enjoyable. Acoustic electrics offer the best of both worlds, enabling you to record and amplify as well as play in a social setting. The beauty of acoustic electric guitars is that they are incredibly versatile instruments. 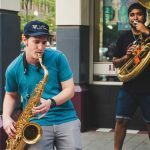 They take all the charm of regular acoustics but add the modern edge which can tip them from forgotten items that collect dust in a garage to professional tools that you can utilize in live situations and in a recording studio. Many people own acoustic guitars, but with an acoustic electric you are signaling that you are prepared to take your playing to another level. 1 What is Acoustic Electric Guitar? 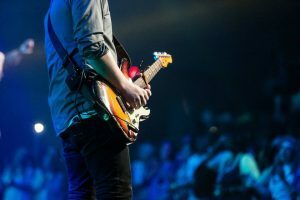 What is Acoustic Electric Guitar? When you are searching for acoustic electric guitars you might find them referred to as electro-acoustic, which means exactly the same thing. Acoustic electric guitars work through a built-in piezoelectric microphone. These can be located either in the sound hole or at the bridge or saddle. In addition, you will always find a preamp built into the body of the guitar to boost the signal created by the microphone. This will need batteries to work, so it’s worth investing in a few to keep you going if you plan on amplifying the guitar. Most of the time you’ll find tone and volume controls or even a frequency equalizer built into the preamp, which will allow you to alter the tone of your guitar through an amplifier during a performance. It’s important that you recognize the distinction between acoustic electric and semi-acoustic guitars. Semi-acoustic guitars are not truly acoustic, and though they will sound pretty good unplugged, their main function is to be amplified. They have chambered bodies, often with a solid block which houses the pickups. Unlike acoustic electrics, the pickups are not piezoelectric microphones and do not need a preamp to boost the signal. The hollow body or chambers will give these guitars resonance and a brighter sound than solid body electric guitars, but often not enough to be heard well unplugged, though there are exceptions to the rule, such as archtop jazz semi-acoustics. Now that you’ve got some idea of what constitutes an acoustic electric, let’s take a look at some models. Martin has been one of the most iconic brands of acoustic and electric acoustic guitars since their founding in 1833. 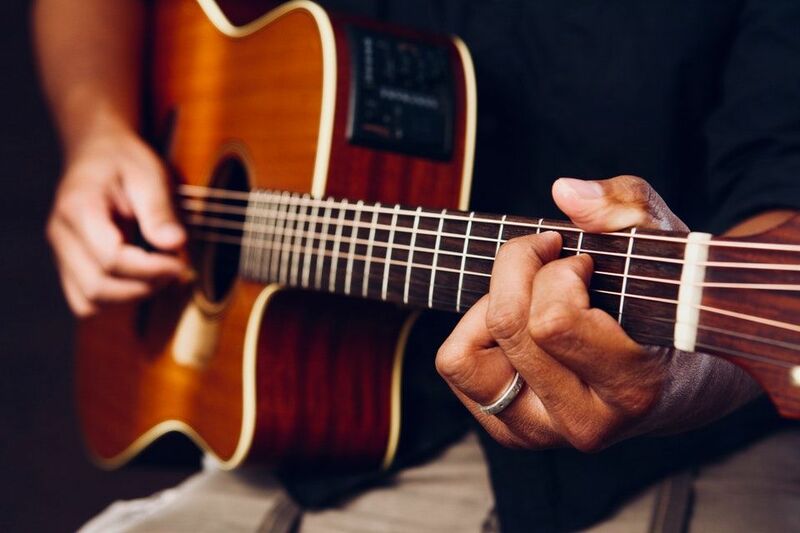 They are credited with many innovations in acoustic guitar manufacturing, including the first dreadnought acoustic guitar in the 1930s, which has since been replicated by other guitar manufacturers. The Martin LX1E is a smaller, lighter acoustic electric than the dreadnought guitars and boasts a simple, classic design. You may have seen one similar in the hands of players such as Ed Sheeran. The material for the body is a high-pressure laminate of sustainable mahogany which gives it the bass tones needed to compete with larger guitars. The top of the guitar the guitar is solid spruce which gives it the high-end frequency need to cut through live mixes. The neck is of multi-piece birch laminate, well finished and finely crafted for comfort. The fingerboard is an undecorated sustainable Richlite, which is actually paper-based material that has the shine and smoothness of ebony. The electrics of the guitar feature a Fishman pickup, a staple of acoustic electric guitars. A nice bonus feature is the onboard tuner. The EQ is a little uncomplicated, with only a tone and volume control to control its sound properties, but with its distinctive tone you won’t notice the difference. Though it may be smaller than many other acoustics, it holds its own sonically, whilst being lighter and more portable than other guitars. Founded in 1962, Japan’s Takamine Guitars, (pronounced ta-ka-mee-nay) were one of the first acoustic guitar manufacturers to feature electrics and the first to design an equalizer component in the preamp, giving greater versatility to acoustic electrics. Notable players of Takamines have been Jon Bon Jovi, Bruno Mars, and Bruce Springsteen. 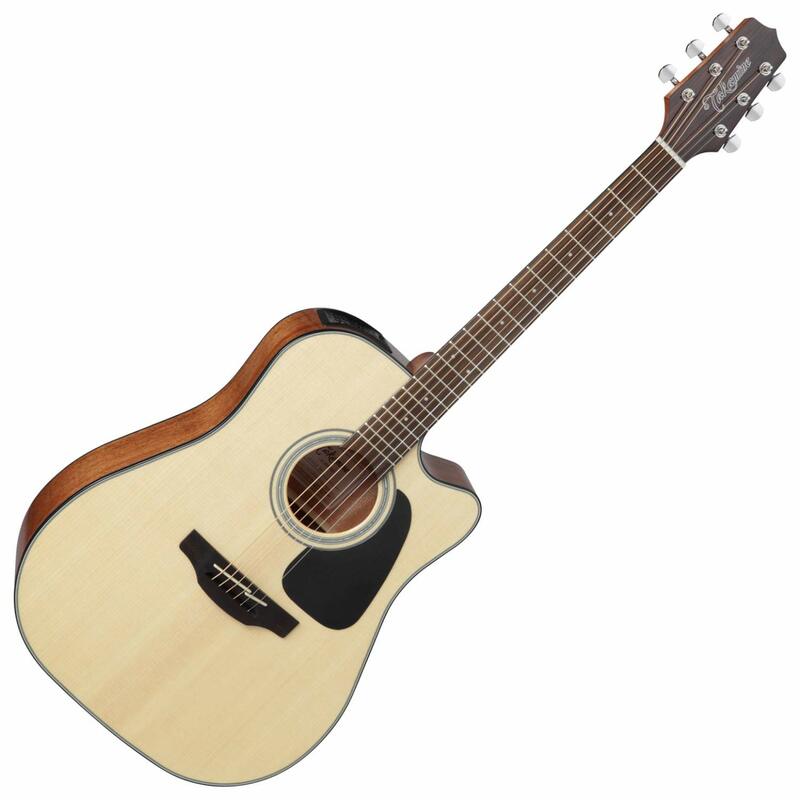 The Takamine G-Series GD30CE is a dreadnought guitar designed for use on stage. It has a single cutaway which gives you access to the upper frets for when you want to play more intricate melodies or want to reach those high pitch harmonics available further up. It features a solid mahogany back and sides giving a deep resonance, with its solid spruce top providing a bright crisp acoustic quality. Unusual in an acoustic guitar, it has a pinless bridge, opting instead for a through-bridge string anchoring system instead, which adds to its overall tone and gives a lot more sustain to each note. One of the great things about Takamine guitars are the electronics. As a pioneer of acoustic electronics, this is hardly surprising. When plugged in, as with all Takamines, you’ll find that the unique pickup and EQ system captures the guitars tonal qualities very well. Solid mahogany means it can be a little on the heavy side. Founded in 1964, the Ovation Guitar Company is known for producing high quality, unique acoustic electrics, and their guitars have been used by some of the best acoustic electric guitar players around, notably Glen Campbell, Al di Meola, and Jimmy Page. What makes Ovation guitars unique are the unusual materials used and its ergonomic design. 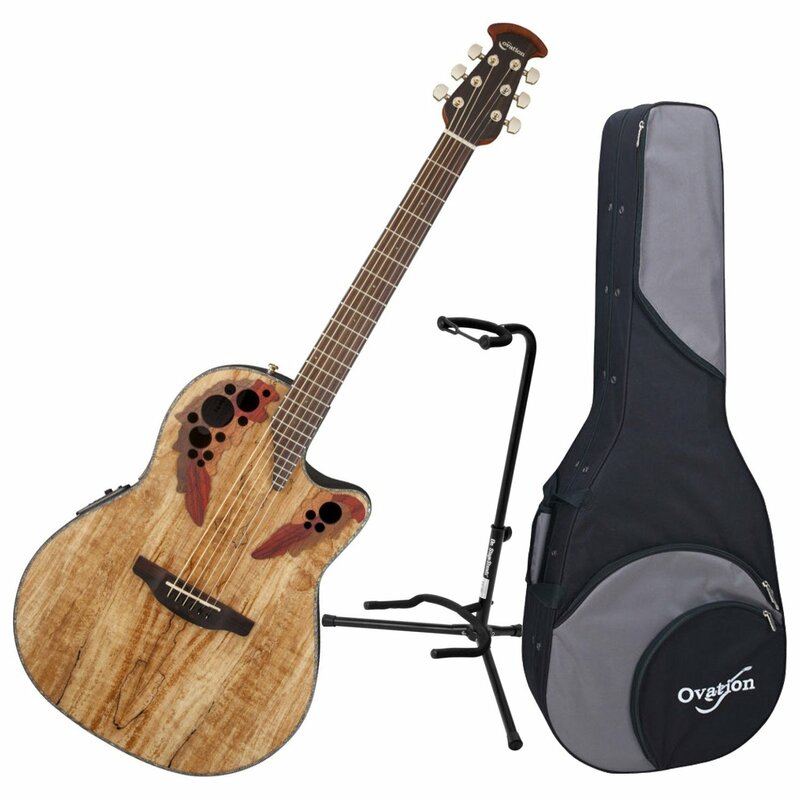 The Ovation Celebrity is no different in this respect, other than it is significantly less expensive than some of Ovation’s higher-end models. The body shape is known as Lyrachord, a rounded contoured back which makes it more comfortable to play than a dreadnought, and a flat maple top – though in this series you can find other types of wood such as Tiger-eye and Koa. The iconic look of Ovation guitars are the sound holes, which feature on either side of the strings instead of underneath. Though this limits the volume of the guitars, it capitalizes on the tonal quality of the woods used, giving it a decent amount of sustain and attack. The fingerboard uses rosewood, often found on electric guitars which gives it a rich warm sound and a classic feel. Ovation produce their own pickups which capture the guitars sound effortlessly, and a preamp which features a three-band EQ and a gain control if you want to overdrive the amplified sound a little. 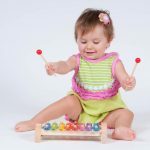 Ergonomic design makes very comfortable to play standing up. Dean Guitars are perhaps better known for their solid body electrics than they are for their acoustic electrics. They are a relative newcomer to the guitar industry, founded in 1976, but due to some notable players, including Dimebag Darrell and Dave Mustaine, they have found their place as a major player in guitar manufacture. The Dean CAE CBK Espana shows just how innovative the company can be, however. As a company known for producing world-class heavy metal guitars, it might be surprising to see an electric acoustic classical guitar, but here it is. As a nylon strung guitar, it lends itself very well to classical music, and unlike many acoustic classical guitars, it features a cutaway making it easier to play the higher notes. The body and the neck are of solid mahogany – rare for any guitar in this price bracket. It has a gorgeous, rich tone as a result and sounds excellent when amped up. The neck is a C shape, which means it may take some getting used to if you’ve been playing guitars with a lower action, but this is often expected from classical guitars. The piezo pickup delivers very well on its sound, and the preamp features a three-band EQ, volume and a tuner. Fender, of course, are one of the most recognizable brand names not only in guitar making but in the world. 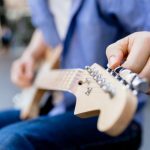 It’s difficult not think of the Fender Stratocaster when conjuring up an image of the electric guitar, but less well known are the superb acoustics and acoustic electrics they manufacture. 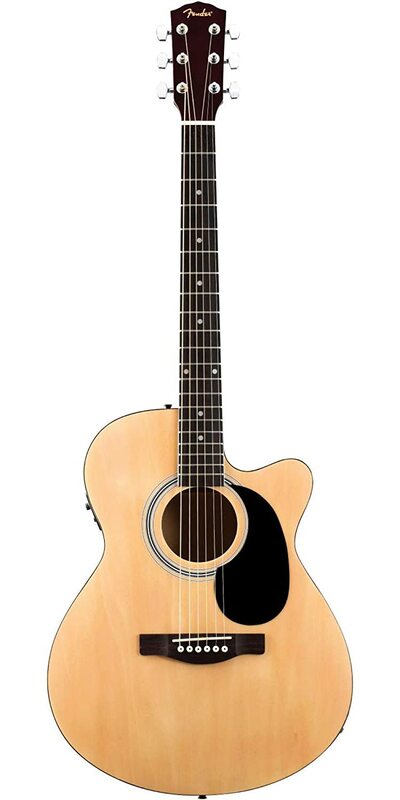 The Fender FA-135CE Concert guitar is a surprisingly inexpensive acoustic electric guitar, given its build quality. The solid basswood back and sides mean that it’s also quite light for its size, whilst sacrificing none of the tone. For its price, it isn’t surprising that the top is a laminated spruce, which guitar snobs might sneer at (as they often prefer a solid top), but the difference, in this case, is negligible. The tone is rich and warm. Though it doesn’t fare as well as its higher-priced acoustic brethren when unplugged, as a live performance guitar, it really flies. The Fishman Ion-T preamp gives a certain boost which gives it a fantastic, well-rounded sound when plugged in. The preamp itself has a simple rotary switch combination of volume, bass, middle, and treble, which should give you plenty of scope to mess around with the tone. 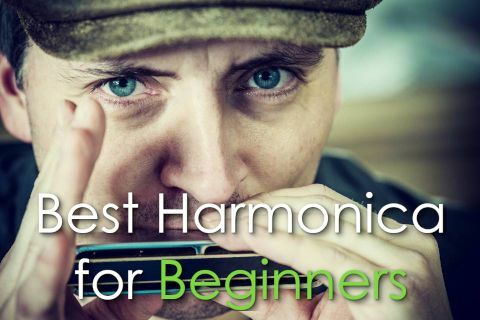 The frets on the rosewood fingerboard are evenly spaced, and even a little shorter than most, which make it quite easy to play and certainly a fantastic investment for beginners. 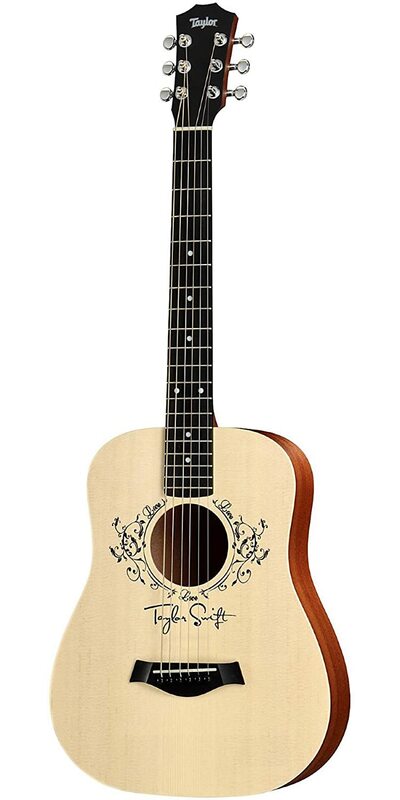 Taylor have become one of the leading players in acoustic guitars and one of the best acoustic electric guitar makers in the world. 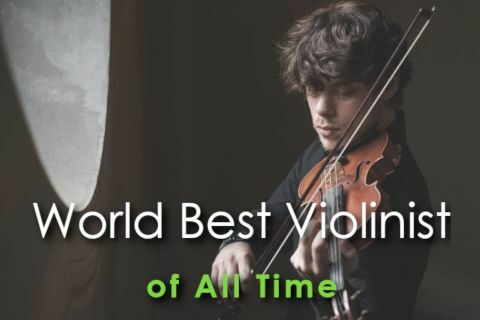 Founded only in 1974 it has boasted some iconic players including Prince, Dave Matthews, Leo Kotke and, of course, Taylor Swift. 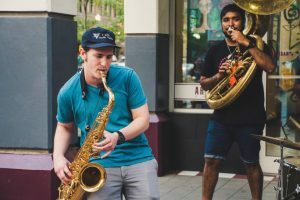 Often, players will turn their nose up at signature models, but it’s important to remember that artists like Taylor Swift are gigging musicians that need a quality sounding instrument that will bear up under constant touring. Collaborating with Swift herself, Taylor have come up with a beautiful instrument based on their compact dreadnought, meaning it has the boom and resonance of a dreadnought but at a more manageable size and lighter frame. 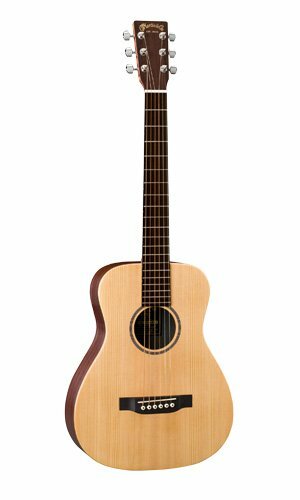 It has laminate sapele body and a solid spruce top, giving it a bright ringing tone which cuts through the mix when plugged in. The neck, unusually for an acoustic, is a bolt-on neck rather than fixed, which whilst it can give it a rather rigid feel, but means you can strum away to your heart’s content without the strings detuning too much. The pickup and preamp are simple constructions, but effective when used in a live gig. 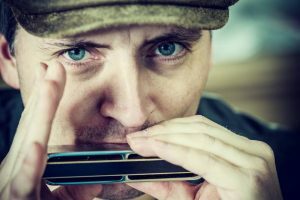 The piezo pick up located behind the saddle, which means it picks up all the brightness of the guitar and can be modified with a simple volume and tone control in the preamp, which sits beside a built-in digital chromatic tuner. So you’ve seen a sample of the products on offer in terms of acoustic electrics, and hopefully, understand the range and variety in which they come. There is a great deal of craftsmanship involved in the making of acoustic guitars which continues to this day. Unlike solid body electrics, the makers of acoustic electrics have to balance the prestigious career of a luthier and the meticulous, detail-orientated mindset of a physician when it comes to creating something that will work well in an informal setting and at gigs and recording studios. 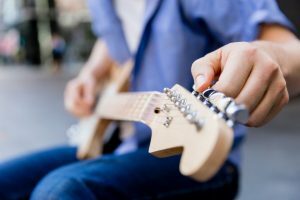 It is easy to land yourself with a useless plank of wood when buying a guitar, and honestly, there are a lot of cheap guitar manufacturers out there who mass produce bow-necked, toneless acoustic electrics which won’t bear up playing more than a few times. But if you are looking for the best acoustic electric guitar, rather than settling for a clunky, rough necked toy, it is worth investing a little more and landing yourself with a work of art that you will play forever.